Bolton for Congress at Large. 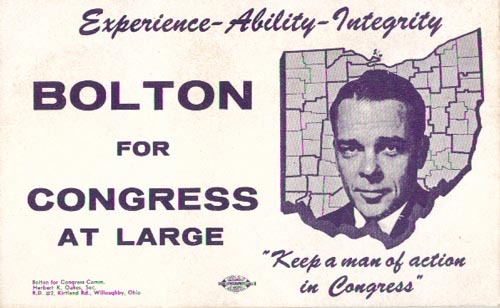 [Fine Print] Bolton for Congress Comm., Herbert K. Oakes, Sec., R. D. #2, Kirtland Rd., Willoughby, Ohio. Are you looking for BOLTON ancestors? If so, we suggest posting a query to our Community Message Board to get assistance from other researchers.